It won't bloom until summer, but already many eyes are on the California buckeye. The tree's blossoms are poisonous to honey bees. 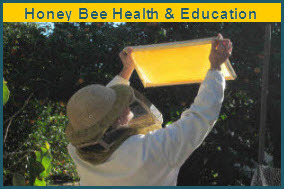 Bees are attracted to them and forage on them, but the end result of the food provisions to the colony can be deformed larval development. 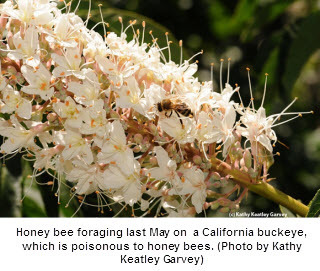 We've seen bee hives within a quarter of a mile of California buckeyes (Aesculus californica). And we've seen honey bees, native bees and other pollinators foraging on the blossoms. At the recent UC Davis Pollinator Gardening Workshop hosted by the California Center for Urban Horticulture, Extension apiculturist Eric Mussen talked about the poisonous plants. (See PowerPoint presentations.) That led to one workshop participant wondering if the flowers of the California buckeye are poisonous to native bees. (Honey bees are not native; the European colonists brought them to the Jamestown colony, Virginia, in 1622).